Reading Recovery in Madison….. 28% to 58%; Lags National Effectiveness Average…. Tap or click for a larger version of the above chart. In investigating the options for data to report for these programs for 2011-12 and for prior years, Research & Program Evaluation staff have not been able to find a consistent way that students were identified as participants in these literacy interventions in prior years. As such, there are serious data concerns that make the exact measures too difficult to secure at this time. Staff are working now with Curriculum & Assessment leads to find solutions. 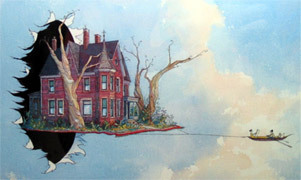 However, it is possible that this plan will need to be modified based on uncertain data availability prior to 2011-12. Much more on Madison’s disastrous reading results, here. Reading continues to be job one for our $392,000,000 public schools. Tap or click to view a larger version of the above image. Measuring Madison’s Progress – Final Report (2.5MB PDF). Given the results, perhaps the continued $pending and related property tax increases for Reading Recovery are driven by adult employment, rather than kids learning to read. 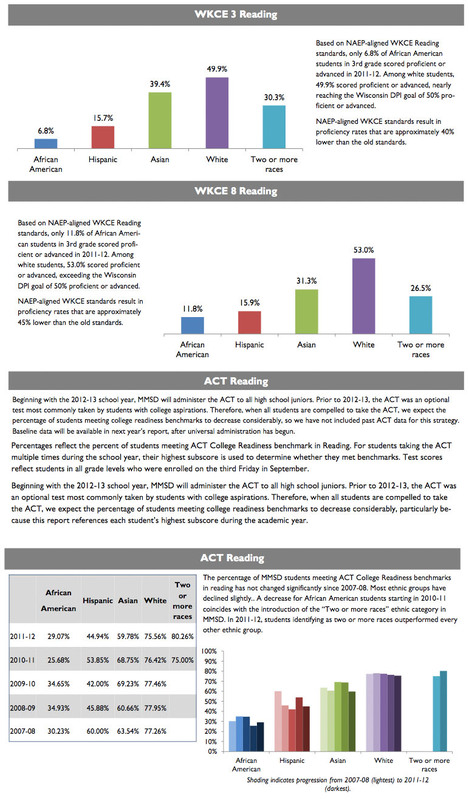 UPDATE: April 1, 2013 Madison School Board discussion of the District’s reading results. I found the curriculum creation conversation toward the end of the meeting fascinating, particularly in light of these long term terrible results. I am not optimistic that student reading skills will improve given the present structure and practices. 30 MB MP3. 2018: Seeing the Forest: Unpacking the Relationship Between Madison School District (WI) Graduation Rates and Student Achievement. These data are alarming. They indicate a real crisis in our schools … and in our community. Everyone — EVERYONE (Superintendent, BOE, Mayor, Urban League, etc.) — should be taking note and talking about what we’re going to do about it. Seriously. It is alarming how few of our students — especially our minority students — are reading well. And it is stunning how little improvement there is from third grade to eighth. It is easy to imagine that poor reading begets academic disengagement and, ultimately, non-graduation. I believe there are empirical studies that indicate as much. Perhaps every program we implement in the early grades should be evaluated for its impact on third grade reading scores. If the initiative does not improve our children’s reading, then we should think long and hard about whether it’s worth the expense. No one succeeds in school without being able to read. The achievement gap is rooted in a reading ability gap. Which is most effectively addressed in the early grades. These results are more than disappointing; they are terrible. Why does this report not include information on the cost of the program? What is the cost per discontinued (i.e. successful) student? If Reading Recovery will be paid for in the future solely out of the Title I funds of participating Title I schools, how much of each school’s Title I funding will Reading Recovery consume? How many more students could have been helped by a more effective, and more cost-effective, reading intervention? 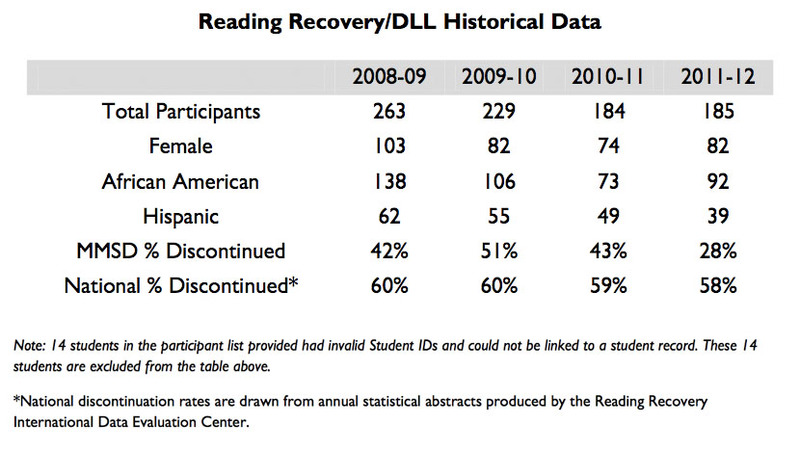 The table above shows that black students are disproportionately enrolled in Reading Recovery. A study by a former Reading Recovery director showed that black students, and particularly black male students, were disproportionately unsuccessful in MMSD’s Reading Recovery. What are the success rates for the latest four years of the program, disaggregated by demographics? What is the relationship between the track record of Reading Recovery and the literacy crisis for black and low-income students in the district? Does Reading Recovery meet the guiding principle of “history of successful practice that is likely to achieve academic success” that charter school proposals will be required to meet? We’ve seen bad numbers from RR for more than a decade. Why is this news? I never understood why it continued to be funded. I wasn’t referring to the Reading Recovery data contained in this post in my earlier comment; I was referring to the WKCE and ACT Reading data. At a recent meeting, one speaker said, matter-of-factly, that the goal to read at grade level by 3rd grade is the goal because after 3rd grade, the schools don’t teach reading but switches to expecting learning through reading. So, if a student is not reading at grade level by then, they are guaranteed to fall further behind. So, the real question is is this goal arbitrary? Is it necessary? Is it wise? Is it justified by anything approaching solid research? 4,5,6 years ago and sooner I railed against RR. Look in the archives. All I got from Larry was snarky “you don’t know what you are talking about” rubbish. And to make matters worse. Our school district is now doubling down with Math Recovery and some other constructivist Discovery Learning pish-posh. My apologies for calling Larry snarky earlier, but I do remember it well. Reed must be misremembering. I’m sure Reed would have railed against RR — that is his modus operandi. But, I would not have supported RR at MMSD since the internal study performed by MMSD and leaked publicly clearly showed problems with its implementation at MMSD. It don’t support RR at MMSD now, since these new numbers show MMSD has still not implemented RR effectively. In particular also, What Works Clearinghouse lists RR as a working model. From the 2008 report. So, I would likely have defended RR generally based on WWC results, and been snarky to Schneider based his typical “railing against”ness, since BS-ness never impressed me. But, certainly would not have defended RR as implemented at MMSD because the study clearly showed it did not work as implemented at MMSD at the time. PS: In a 2009 report, WWC did NOT certify RR as effective for ELL students. Thanks for posting the Double Jeopardy paper. However, it doesn’t answer my questions, except to confirm by the absence of evidence that the 3rd Grade cutoff is arbitrary. Nothing in the Double Jeopardy report says efforts into improve the reading skills of kids in the 4th grade and beyond failed, or that there was any such intervention. An analogy is doctors giving antibiotics to children with a bacterial infection with the typical 10-day regimen. After 10 days, the doctor proclaims that the kids who have not recovered are incurable. This is in contrast to trying a different antibiotic, or extending the regimen for another week, etc. This study results seem to be a no-brainer, concluding what would be fairly obvious. If one doesn’t learn to read well by 3rd grade, and by accident and bad fortune doesn’t get help learning to read after that, then a high percentage will not graduate from high school. My interpretation is that once kids are not proficient in reading, the schools do not intervene effectively, if at all, to support these kids. Perhaps we can use Emily Auerbach’s Project Odyssey’s success as an example that effective intervention exists and is doable, even as late as for adult learners. Also, although I am not well-versed in the brain research dealing with the optimal time for children to learn how to read, I will point out that — as with so many educational things — early exposure and early learning are widely thought to be best. With reading specifically, I think the socioemotional context for learning to read gets ever more complicated and challenging as the student gets older. So again, it’s best to lay a solid foundation in the earlier grades. Finally, the Odyssey Project is not a literacy program. Students accepted into the program must be able to read, and well. We need to recalibrate expectations from K-7!